Matthew Apgar - mapgar@shawmedia.com Josh Stenger of Huntley gets a hug from coaches Rich Tado, left, and BJ Bertelsman after winning his 120 pound finals bout in the IHSA Class 3A Barrington Individual Sectional wrestling tournament on Saturday, Feb. 13, 2016 at Barrington High School in Barrington. Stenger won by fall in 3:11. Matthew Apgar - mapgar@shawmedia.com Josh Stenger of Huntley pins Khalil Johnson of Zion-Benton during their 120 pound bout in the IHSA Class 3A Barrington Individual Sectional wrestling tournament on Saturday, Feb. 13, 2016 at Barrington High School in Barrington. Stenger won by fall in 3:11. 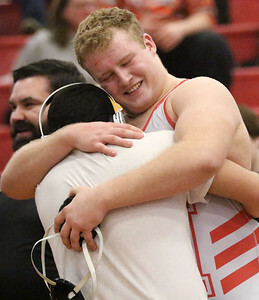 Matthew Apgar - mapgar@shawmedia.com Dominic Swanson of Huntley gets a hug from teammate Petros Mihlapolas after Swanson won his 285 pound bout against Nick Grujanac of Stevenson in the IHSA Class 3A Barrington Individual Sectional wrestling tournament on Saturday, Feb. 13, 2016 at Barrington High School in Barrington. Matthew Apgar - mapgar@shawmedia.com Jack Golnick of Jacobs, left, wrestles with Christian Rodriguez of Dundee Crown during their 220 pound bout in the IHSA Class 3A Barrington Individual Sectional wrestling tournament on Saturday, Feb. 13, 2016 at Barrington High School in Barrington. 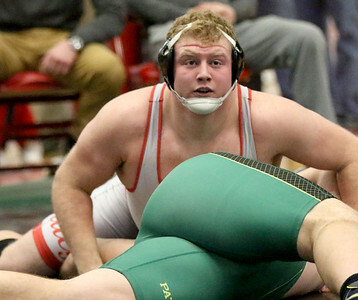 Matthew Apgar - mapgar@shawmedia.com Dominic Swanson of Huntley, top, pinsNick Grujanac of Stevenson during their 285 pound bout in the IHSA Class 3A Barrington Individual Sectional wrestling tournament on Saturday, Feb. 13, 2016 at Barrington High School in Barrington. 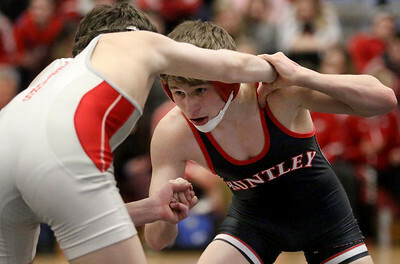 Matthew Apgar - mapgar@shawmedia.com Zach Spencer of Huntley, right, takes on Holden Heller of Deerfield during their 113 pound final bout in the IHSA Class 3A Barrington Individual Sectional wrestling tournament on Saturday, Feb. 13, 2016 at Barrington High School in Barrington. 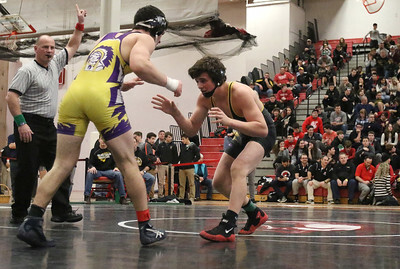 Matthew Apgar - mapgar@shawmedia.com Dean Lane of Jacobs, right takes on Dominic Ballano of Hononegah during their 160 pound bout in the IHSA Class 3A Barrington Individual Sectional wrestling tournament on Saturday, Feb. 13, 2016 at Barrington High School in Barrington. Matthew Apgar - mapgar@shawmedia.com Jacobs coach Gary Conrad calls out to his wrestler, Dean Lane, right, during the 160 pound bout in the IHSA Class 3A Barrington Individual Sectional wrestling tournament on Saturday, Feb. 13, 2016 at Barrington High School in Barrington. 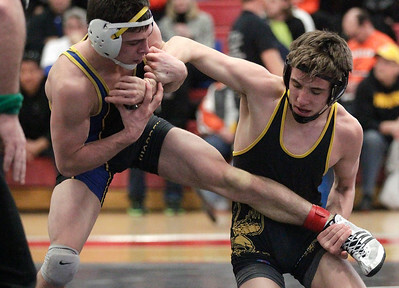 Matthew Apgar - mapgar@shawmedia.com Alec Riportella of Mundelein, left, takes down Lucas Busse of McHenry. 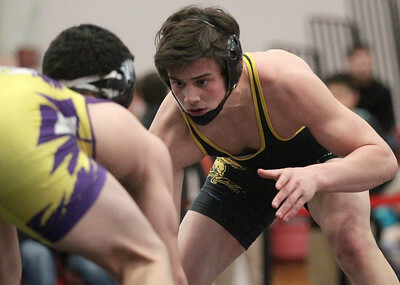 right, during their 120 pound bout in the IHSA Class 3A Barrington Individual Sectional wrestling tournament on Saturday, Feb. 13, 2016 at Barrington High School in Barrington. Matthew Apgar - mapgar@shawmedia.com Josh Stenger of Huntley, top, pins Kahlil Johnson of Zion-Benton during their 120 pound final bout in the IHSA Class 3A Barrington Individual Sectional wrestling tournament on Saturday, Feb. 13, 2016 at Barrington High School in Barrington. Matthew Apgar - mapgar@shawmedia.com Ulisies Jacobo of Dekalb, left, wrestles Dylan Elmore of Harlem during their 132 pound bout in the IHSA Class 3A Barrington Individual Sectional wrestling tournament on Saturday, Feb. 13, 2016 at Barrington High School in Barrington. 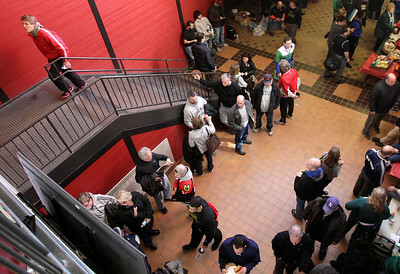 Matthew Apgar - mapgar@shawmedia.com Wrestlers and fans pack the hallways during an intermission in the IHSA Class 3A Barrington Individual Sectional wrestling tournament on Saturday, Feb. 13, 2016 at Barrington High School in Barrington. 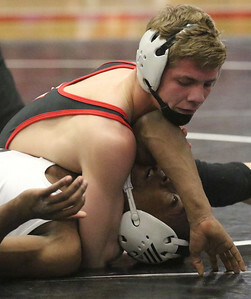 Matthew Apgar - mapgar@shawmedia.com Josh Stenger of Huntley, left, takes on Kahlil Johnson of Zion-Benton during their 120 pound final bout in the IHSA Class 3A Barrington Individual Sectional wrestling tournament on Saturday, Feb. 13, 2016 at Barrington High School in Barrington. Matthew Apgar - mapgar@shawmedia.com Lucas Busse of McHenry, top, gets the better of Mitch MacTavish of Hersey during their 120 pound bout in the IHSA Class 3A Barrington Individual Sectional wrestling tournament on Saturday, Feb. 13, 2016 at Barrington High School in Barrington. 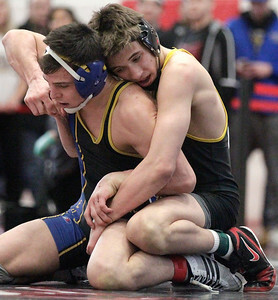 Matthew Apgar - mapgar@shawmedia.com Beau Harrier of Jacobs, left, tries to find a way out of the grasp of Wheeling's Mason Skloot during their 113 pound bout in the IHSA Class 3A Barrington Individual Sectional wrestling tournament on Saturday, Feb. 13, 2016 at Barrington High School in Barrington. 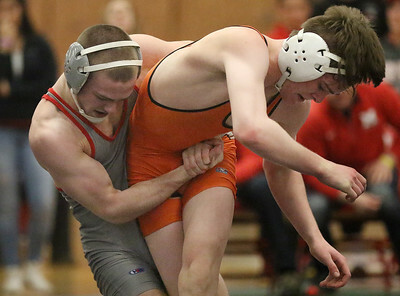 Matthew Apgar - mapgar@shawmedia.com Derek Neises of McHenry, left, wrestles against Ulisies Jacoboo of Dekalb during their 132 pound bout in the IHSA Class 3A Barrington Individual Sectional wrestling tournament on Saturday, Feb. 13, 2016 at Barrington High School in Barrington. 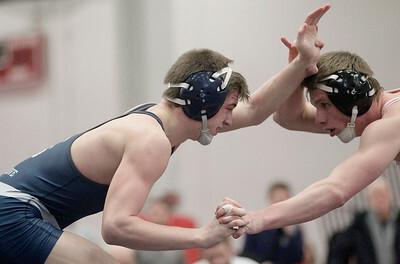 Matthew Apgar - mapgar@shawmedia.com John Cullen of Cary-Grove, left, wrestles with Dylan Mannes of Grant during their 138 pound bout in the IHSA Class 3A Barrington Individual Sectional wrestling tournament on Saturday, Feb. 13, 2016 at Barrington High School in Barrington. 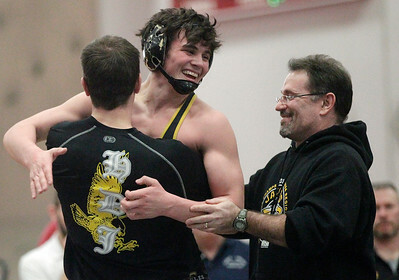 Matthew Apgar - mapgar@shawmedia.com Dean Lane of Jacobs jumps into the arms of coach Gary Conrad, left, after winning his 160 pound bout in the IHSA Class 3A Barrington Individual Sectional wrestling tournament on Saturday, Feb. 13, 2016 at Barrington High School in Barrington. Matthew Apgar - mapgar@shawmedia.com Jake Leske of McHenry, left, locks in on Nikita Nepomnyashchly of Stevenson during their 170 pound bout in the IHSA Class 3A Barrington Individual Sectional wrestling tournament on Saturday, Feb. 13, 2016 at Barrington High School in Barrington. Matthew Apgar - mapgar@shawmedia.com Michael Bujacz of Jacobs, top, pins Jenner Hecoz of Harlem during their 195 pound bout in the IHSA Class 3A Barrington Individual Sectional wrestling tournament on Saturday, Feb. 13, 2016 at Barrington High School in Barrington. 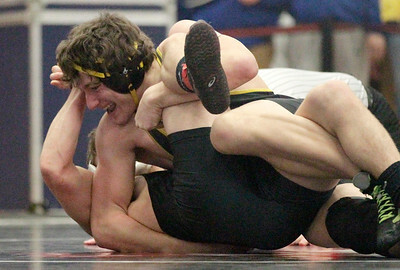 Matthew Apgar - mapgar@shawmedia.com Chris Dranka of Jacobs, right, tries to keep his grasp on Warren's Grant Zamin during their 138 pound bout in the IHSA Class 3A Barrington Individual Sectional wrestling tournament on Saturday, Feb. 13, 2016 at Barrington High School in Barrington. 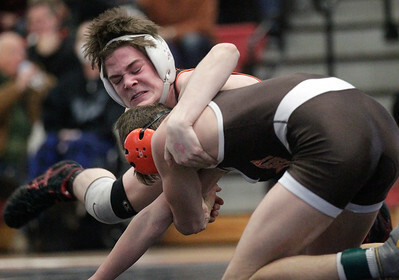 Matthew Apgar - mapgar@shawmedia.com Lucas Busse of McHenry, right, grapples with Mitch MacTavish of Hersey during their 120 pound bout in the IHSA Class 3A Barrington Individual Sectional wrestling tournament on Saturday, Feb. 13, 2016 at Barrington High School in Barrington. 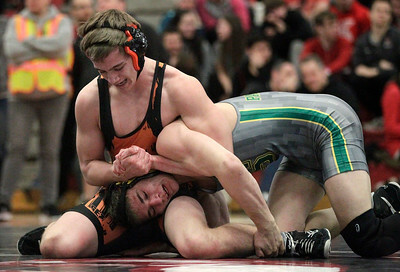 Matthew Apgar - mapgar@shawmedia.com Derek Neises of McHenry, front, wrestles against Ulisies Jacoboo of Dekalb during their 132 pound bout in the IHSA Class 3A Barrington Individual Sectional wrestling tournament on Saturday, Feb. 13, 2016 at Barrington High School in Barrington. Matthew Apgar - mapgar@shawmedia.com Dean Lane of Jcobs, right, takes on Dominic Ballano of Hononegan during their 160 pound bout in the IHSA Class 3A Barrington Individual Sectional wrestling tournament on Saturday, Feb. 13, 2016 at Barrington High School in Barrington. 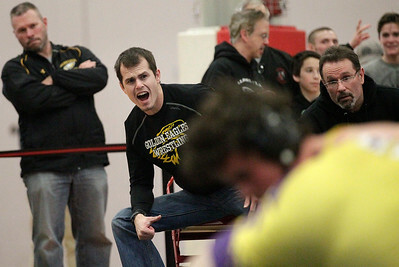 Matthew Apgar - mapgar@shawmedia.com Huntley wrestling coach BJ Bertelsman uses a smartphone to record video for twitter of his wrestler Petros Mihlapolas as he is introduced as a state qualifier at the IHSA Class 3A Barrington Individual Sectional wrestling tournament on Saturday, Feb. 13, 2016 at Barrington High School in Barrington. 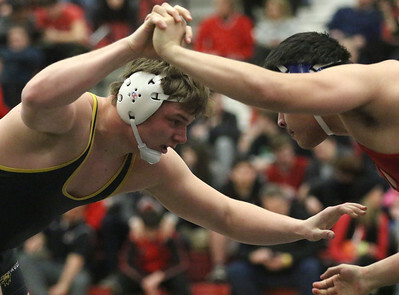 Jack Golnick of Jacobs, left, wrestles with Christian Rodriguez of Dundee Crown during their 220 pound bout in the IHSA Class 3A Barrington Individual Sectional wrestling tournament on Saturday, Feb. 13, 2016 at Barrington High School in Barrington.